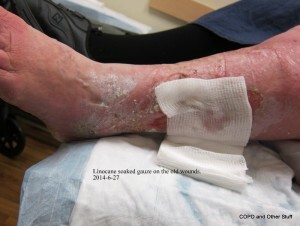 One Face of MRSA – What Does the Resistance Bug MRSA Look Like in Kitsap County? Here is one face. Ignoring edema in your lower legs? I did. Ask your doctor how to get rid of it – permanently…not just take water pills and forget it. There is a reason edema develops for each person. Find out the cause, and, if possible – fix it. You do not want what I have. Ask your partner – your doctor. The latest recent culture of my open wound came back positive again – the second positive result since it began again in my lower left leg, October 2013..
“MRSA stands for methicillin-resistant Staphylococcus aureus. It causes a staph infection (pronounced “staff infection”) that is resistant to several common antibiotics. There are two types of infection. Hospital-associated MRSA happens to people in healthcare settings. Community-associated MRSA happens to people who have close skin-to-skin contact with others, such as athletes involved in football and wrestling. If a wound appears to be infected, see a health care provider. Treatments may include draining the infection and antibiotics. The understated low-slung buildings in the old Sheridan Village show a benign face to the wounded people who fight life and death wound care treatment inside. Opening the door to the reception area brings a cheery “Hi! …Debbie knows your name. Debbie Knows Your Name and smiles a welcome! Debbie is usually the first introduction to the amazing friendly, competent and cheerful docs, nurses, technicians – all the great people working there. The patients reflect their environment as does the varied reading material offered. From deep sea training to bird reading …nothing ordinary about this place or the people in it – health care or patients. A minor breakthrough happened when I awoke a few mornings ago feeling nothing. 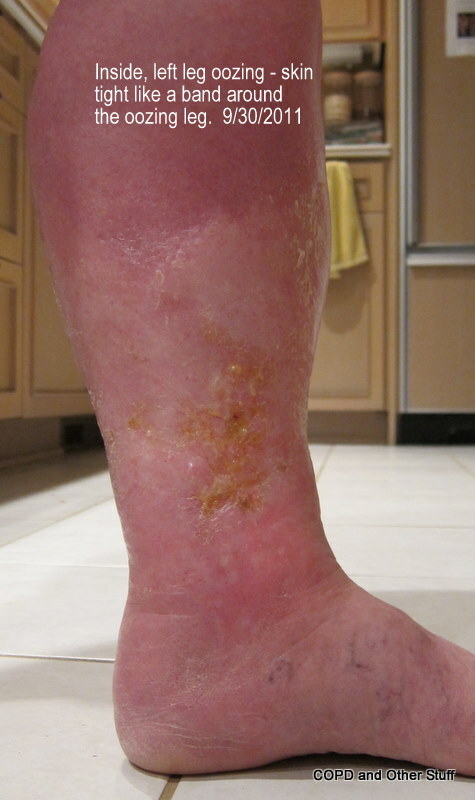 An absence of pain in my leg – no pain anywhere….the apparent result of the new sulfur antibiotic for the escalating lymphedema/cellulitis/MRSA wounds in my left leg. Debriding is done with a sharp razor after the wounds get surface Lidocaine to deaden the flesh. Most of the time it works. 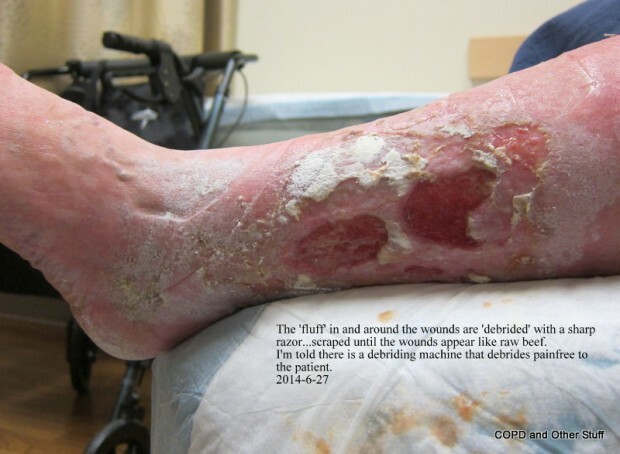 GOOD NEWS: I heard about an Ultrasonic Debridement machine – pain free that takes the place of a sharp razor and found a study on it in Ontario, Canada. The start date was December 2013 – Estimated completion December 2014. Brief Summary The UltraHeal Study is a randomized controlled trial to compare healing response of low frequency contact ultrasonic-assisted debridement in addition to best practice wound care to best practice wound care alone in a Vascular Surgery Clinic patient population with wounds of the lower extremity. Detailed Description The study will also investigate the bacterial tissue burden and protease activity to provide further insight into the infection and inflammation aspects of healing barriers in a challenging population. Harrison Medical Center Foundation – how can we help you help us get that machine if the study is successful? I am writing this from a hospital bed on the cancer floor at Harrison Medical Center in hope someone will take note what edema can and may do to those who ignore it. Also, I’m writing in heartfelt thanks to Dr. Halligan, Internist/Surgeon at Silverdale Doctor’s Clinic who saved my life and leg recently by taking over failed treatment for my Lymphedema/Cellulitis/Edema filled legs and painstakingly, day after day treated and changed leg wraps. Dr. Halligan patiently explained my left leg needed debriding to remove the dead skin, much as burn victims and he couldn’t tell what was under the surface dead skin or how deep the dead tissue went. This four-month pain riddled sleep deprived patient gratefully lay in a bed at Harrison Bremerton 23 hours a day, 7 days a week. Four weeks total this Thursday. Tomorrow, Wednesday, I am moving to a rehab place for rehabilitation and further healing. Chris Goss, MD, my lung doc at the University of Washington Medical Center straightened out the Restless Leg Syndrome medication problem so I could sleep if the pain eased. 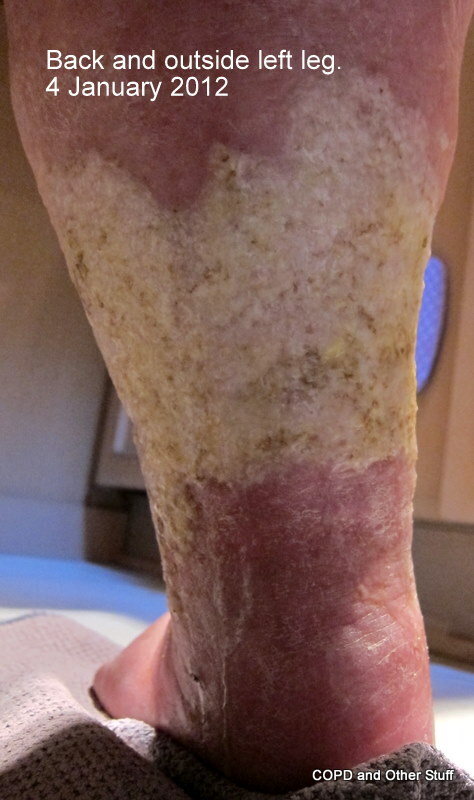 Edema patients – PLEASE – check out the following photos of the latest rise and fall of my edema filled legs and ask yourself if ignoring edema is worth it. 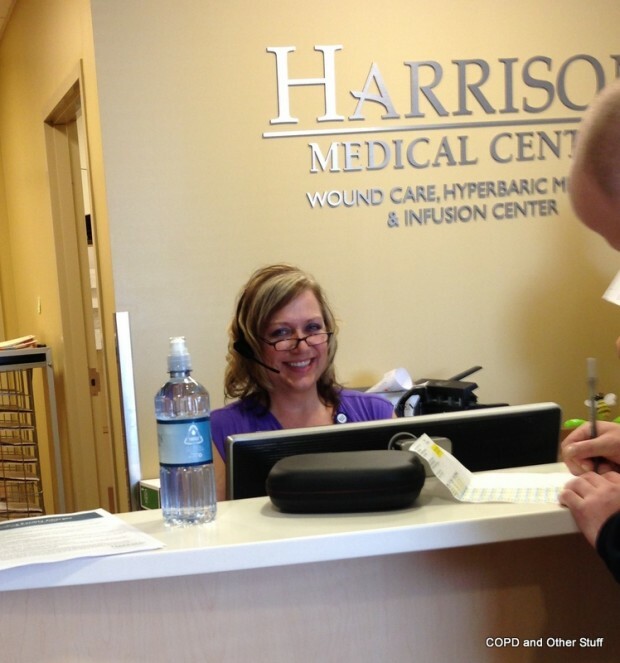 Dr. Halligan – thank you! More next time on Harrison Medical Center’s Angels in disguise. 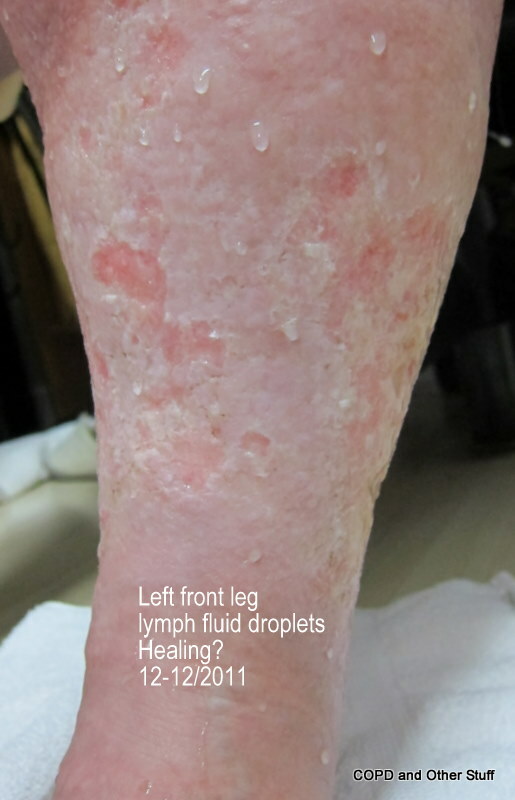 Cellulitis and Lymphedema – Bah Humbug! 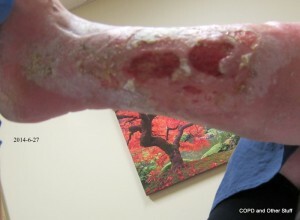 Cellulitis/Lymphedema is nasty. Did I mention it is painful? Moreover, it takes ‘forever’ to heal – or so it seems. This time, the weeping sores have spread all the way around my lower left leg. Seeing the blood on the old pads covering the wounds was new. The blood was new but I was told by a medical person when I called the office that it meant the skin was healing and not to worry. Well. Okay. I am not worried either that yesterday in the shower hunks of skin sloughed off my leg. The stinging and burning was harsher than usual but I could not see what my husband was talking about until I saw the photos he took of my leg before he rewrapped it. The medical person who told me my leg was healing might be wrong. According to her, I should have healed last week. 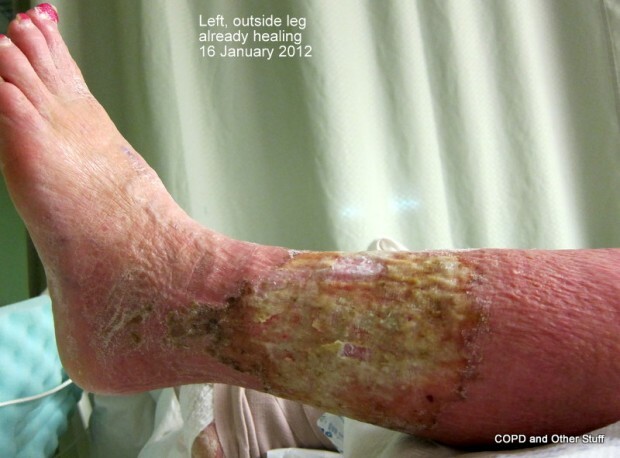 Nothing, this time, resembles what has happened with prior cellulitis/lymphedema ‘attacks’. 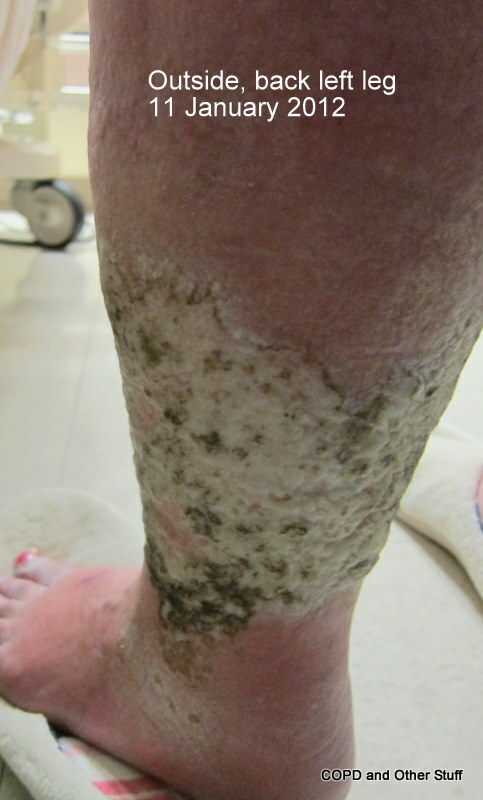 What have other patients done to help heal cellulitis/lymphedema? I don’t know what to do next. What we’ve been doing isn’t working. Beginning to feel like a monkey swinging off the end of a branch high up on a snag tree in the middle of a windstorm – I know storms abate and wounds heal! Does a hospital’s right to hire smokers trump a patient’s right to breathe clean air? The new aide came closer to take vitals until she was close enough to smell cigarette smoke on her. “Smoker”? I asked – she said, “Yes” and continued to wrap the blood pressure cuff around my left arm and placed the thermometer into my mouth. She agreed and I suggested she wash her hands. She said she did but the smoke smell did not come off. 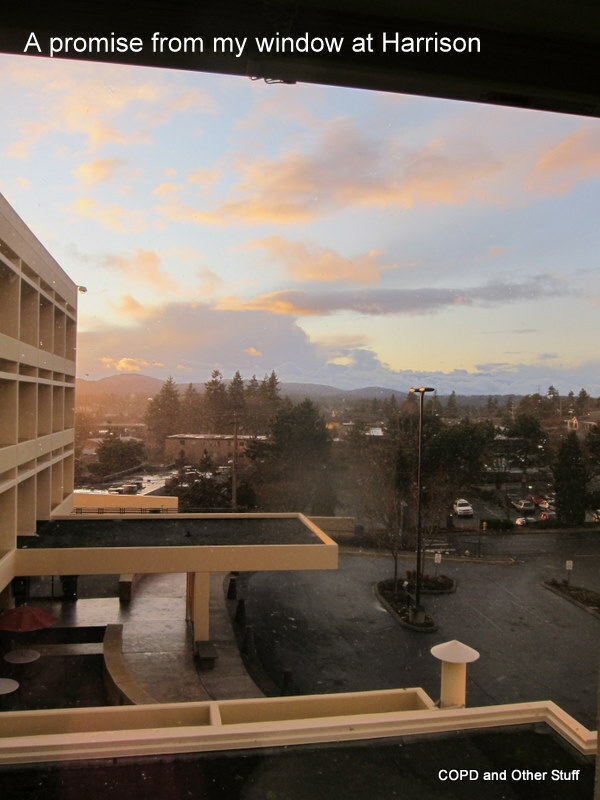 I was trapped – a hospital patient forced to inhale cigarette smoke from a hospital worker. She said she would get someone else to do my vitals. Funny thing. I was in that hospital because of a forty-year smoking habit and developed emphysema (COPD) due – probably – to smoking. I stopped smoking in 1997 – a tough time that took me over two years to get over the gut wrenching addiction urge to smoke again…and here I was trapped in the hospital, forced to inhale smoke from a hospital employee reeking of cigarette smoke. The irony of all their outside hospital signs proving they were a “Smoke-free” hospital and grounds was laughable. I complained. The hospital person I complained to told me they would get someone else to do my vitals…that I did not have to have a smoker helping me. I asked about the other seniors – any patient – who would probably not complain of being forced to inhale the toxins of cigarette smoke from a hospital employee for fear of retaliation…no one seemed concerned about them. Apparently, the issue is only an issue with me, an ex-smoker, as far as the hospital is concerned. A few hours later, the RN came in with the vials of antibiotics and other meds that went directly into my veins. He dropped one vial, hesitated, picked it up, hooked it into the devise going directly into my vein, and plunged the contents inside. Neither of us said a word. I remember thinking, isn’t this hospital floor dirty? And hoped the contents of the vial stayed uncontaminated. As an almost thirty year hairdresser, if I dropped a comb on the floor it was cleaned and re-sterilized before touching a patron. Apparently, hospitals are different. A while later it was time to hook up the oxygen tube to my bipap. I pulled to get it for her but the end was stuck between the hospital bed wheel and the metal bedframe I’d just lowered. I left to visit the bathroom and when I came back, the hospital employee had ‘fixed’ it. I looked and she had placed the deformed tube end on my machine but had not pushed it on to secure it. I did it and went to bed…wondering why an employee was allowed to reek of cigarette smoke and work around patients….wondered why an RN didn’t throw the vial away and get a new one for the patient when it dropped to the dirty floor…wondered why the tube end of the oxygen tube wasn’t replaced by a clean, sterile one when it had been lodged against the dirty hospital bed wheel. To be clear…I do not care if the hospital person smokes. I care when her/his right to smoke interferes with my right to breathe clean air – especially in a hospital. I was discharged and came home the next day. Am I overreacting and expecting too much from a hospital? COPD – Chronic Obstructive Pulmonary Disease for many people is only the beginning of a series of medical conditions. 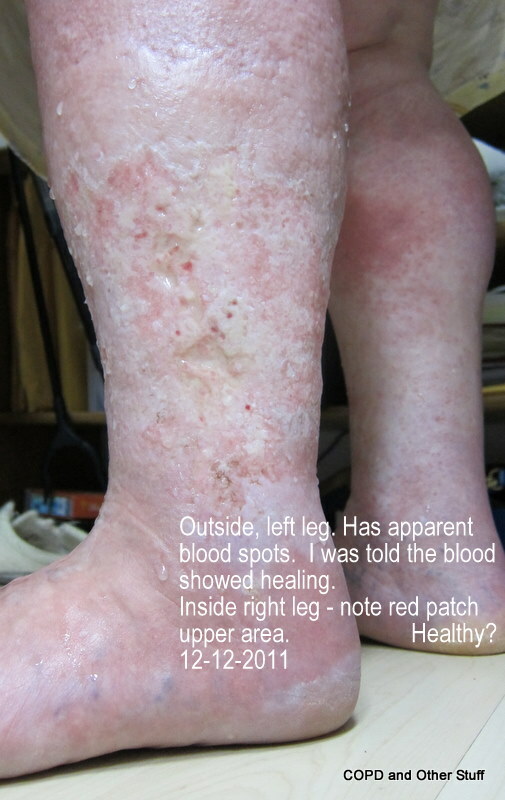 For me the latest is Cellulitis/Lymphedema – nasty painful stuff…you do not want. Apparently, COPD trips the immune system for some of us leaving us open to whatever comes down the pike. Lessons to be learned – do not let COPD develop. Find a doctor willing to give a four-minute Spirometry test with annual physicals for early detection COPD and other issues, including asthma. COPD leads down a path you might well avoid with early detection. 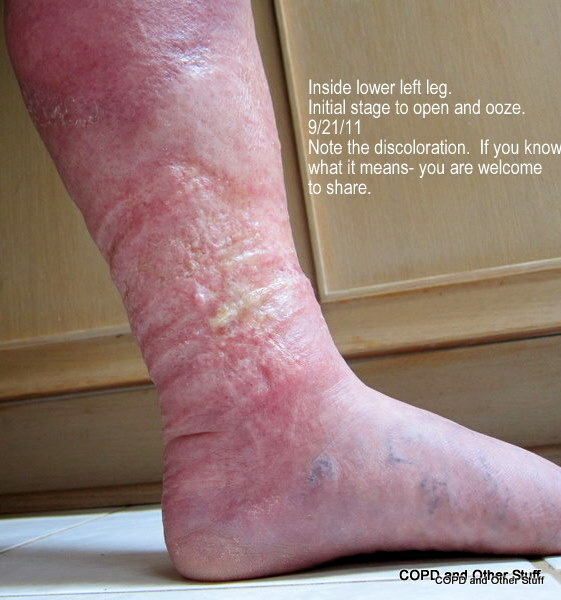 Cellulitis and Lymphedema can arrive by ignoring edema, as I did for years after my COPD diagnosis. 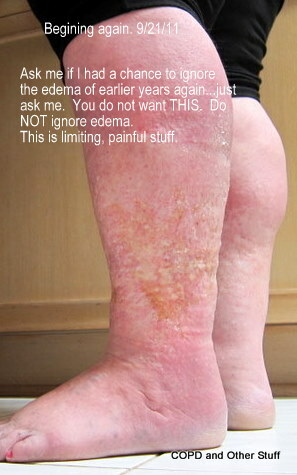 If you have edema, follow your doctor’s instructions to get rid of it. Cut out the salt –whatever it takes – do it to avoid what is now for me, a chronic medical issue. Did I mention painful? Do whatever it takes to avoid it…beginning with COPD early detection Spirometry. Cellulitis pain is a great leveler…after days and weeks of it, I can’t find my notes from the ER. Tessie and Florida Girl are RN’s working the shift and the care they give er patients is extraordinary. The plus side – it has been over a year since the last open weeping and leg pain thanks to getting patient education and lessons on wrapping legs from Mellissa Mercogliano, PT, OCS at the Center for Orthopedic & Lymphatic Physical Therapy in Port Orchard. No water workout until this stuff heals.